At Flooring Canada Tillsonburg, home remodelling has never been easier. As one of the leading suppliers of wood-look tile in Tillsonburg, ON, we make it easier for customers to change the look, feel, and ambiance of their homes. Visit our showroom to view our vast selection of flooring. With our personalized approach to service, you have the power to realize your ideal spaces. Now, there’s no need to choose between strength and beauty. With wood plank porcelain and ceramic tile, you may have both. By striking a good balance between durability and aesthetic appeal, this flooring type is a smart investment. Wood-look tile flooring is distinct in that it is ceramic or porcelain flooring that successfully emulates the appearance and texture of natural hardwood [link to Hardwood Flooring]. It is available in many wood species, including pine, oak, and mahogany. With so many designs and variations of this flooring available, your interior design options are limited only by your imagination. The unique manufacturing and finishing process of wood-look tile ensures it is a solid and dense material that repels water. Moisture will not warp, shrink, or deform tiles. As such, you will have the flexibility to have wood-look flooring in a variety of spaces, including moisture-prone rooms like the kitchen or basement. The robustness of wood plank ceramic tile also means it is easy to maintain. Tile will not absorb dirt or dust. As a result, it requires less time and energy to clean it up. Thanks to its stain-fighting properties, this flooring type has become popular amongst active households with children and pets. Ceramic and porcelain wood tile also accommodate distinct heating options that will elevate the luxury and comfort of your interior. It is one of the few materials that accept underfloor heating systems, thanks to its density and ability to distribute heat evenly. At our showroom, we’ve worked hard to ensure your remodelling project is a simple, stress-free, and rewarding experience. We have teamed up with the leading manufacturers to offer an extensive selection of flooring. At our location, you may view our catalogue, find your favourites, and plan your project. If you need help, our associates are always available to lend a hand. We will work with you to find the right flooring that will meet your needs. Ensure the lasting appeal, strength, and value of your home with our professional installation services. Our skilled crews are knowledgeable and experienced in the installation of porcelain and ceramic wood tile. Whether you are re-flooring your favourite room or planning a complete home makeover, you may count on us to support you at each step of your remodelling journey. 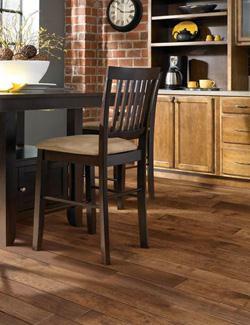 Contact us to learn more about our wood-look tile flooring. Our showroom is based in Tillsonburg, ON, and we serve customers in Langton, Port Burwell, Aylmer, St. Thomas, and the surrounding area.